Getting this recipe was no small task. For those of you who have Italian mothers who are great cooks, you know getting them to show you EXACTLY how much goes into the mix is quite a job. I didn't own a measuring set before I started this site. I'm my mother's daughter! 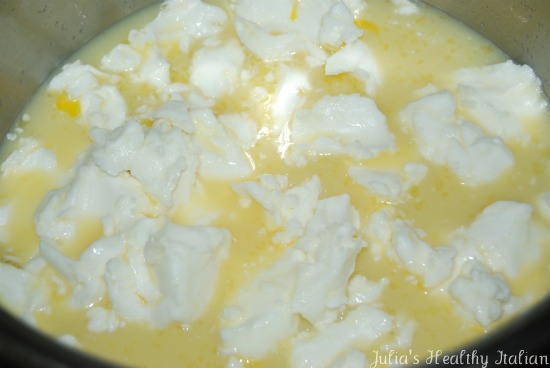 In a medium pot, add sugar and milk on low heat to melt the sugar, about 5 minutes or till milk is just luke warm, not hot. Mix well till blended. Remove from heat. 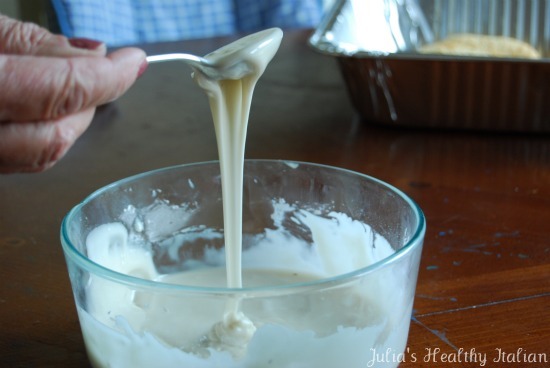 In the same pot add eggs, Crisco and extracts, mix with a fork for a few seconds, mix will be very lumpy. Add baking powder then 9 cups of flour to the same pot, one at a time, mixing with your hands. 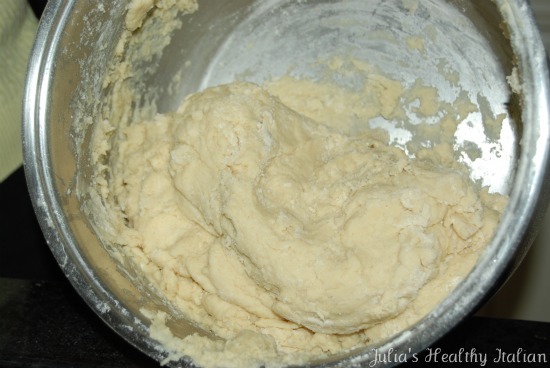 Once the dough pulls away from the pot, place onto of the kitchen counter to knead. 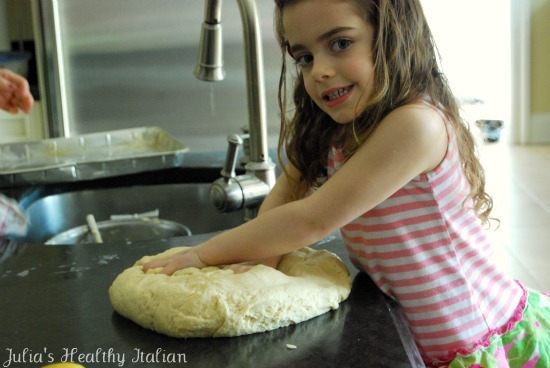 Knead dough for just 1 minute, pushing it out in front of you, then pulling it back towards you, it's so easy a 4 year old could do it! 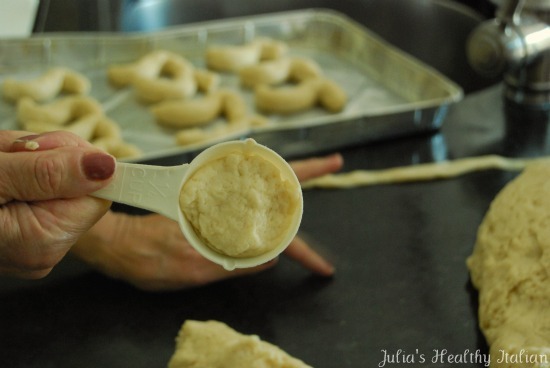 Use 1/4 cup measurer to scoop out even amounts of the dough. Roll the 1/4 cup of dough into a log, then into an S shape or an 8 shape. Arrange the cookies on a cookie sheet about an inch apart. Bake in a preheated oven at 400 degrees until golden, about 18 minutes. The cookies will puff up and become lightly golden. Dip the face of the cookie into the icing. With your finger, wipe off excess and let dry until it hardens. Makes about 50 cookies, just enough for you to eat and freeze! I grew up on these cookies! My name is Sara, so when I was little I called these "Sara cookies" becuase I assumed they were named after me! That's so sweet. I love that. I grew up on these too, I'm so glad I finally got this recipe down . I make these for my 4 kids, they love them. I fill them with fig, almonds and chocolate for Christmas, they are heavenly! 1 of my girls names begin with S. Do you mind if I use this idea on her? It's an adorable idea!!! It's funny but it seems like the secret to a lot of my grandmother's baking was crisco. She never liked to use butter but nowadays I hear that crisco is so unhealthy so I never want to use it. What do you think? Is it okay in moderation? It amazes me how the people bake without measurements!! I need to measure everything! Love the photo of Silvana! Michelle, I'm thinking Crisco is probably not considered a health food, but it's gotta be better than butter...it is VEGETABLE shortening :)...doesn't that count as a veggie, LOL!!! Lol, Christine I hear ya! 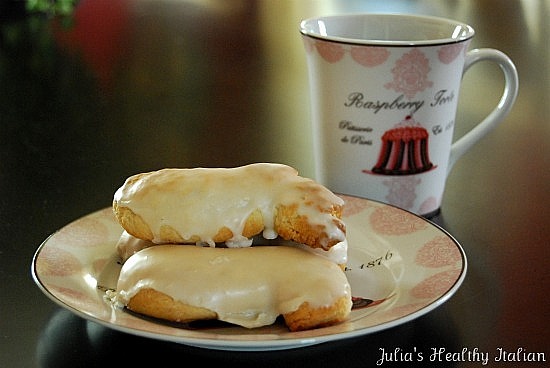 Hey Julia, i'm making these and maybe I'm missing it but where do you add the baking powder? i made these yesterday and hey came out great. Cbmccullough, glad to hear! I will post the fig filling for these cookies soon. 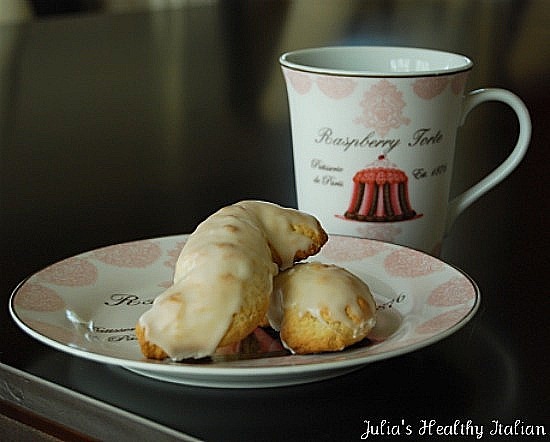 Julia - came to your site looking for an S cookie recipe and now want to try so many of your delicious looking meals! My grandmother was an amazing Sicilian cook - but she never shared her recipes. Now that she has passed on - I am trying to recreate memories and recipes. Your blog is both helpful and inspiring! Thank you! Also - I am searching for history on the S cookies. Would you know why the "S" shape? Hi Theresa, thank you! I love to hear that! Not sure why they are S shaped more than that they are prettier that way. If you make the straight, they arent nearly as appealing to the eye. I should google it and see what comes up. 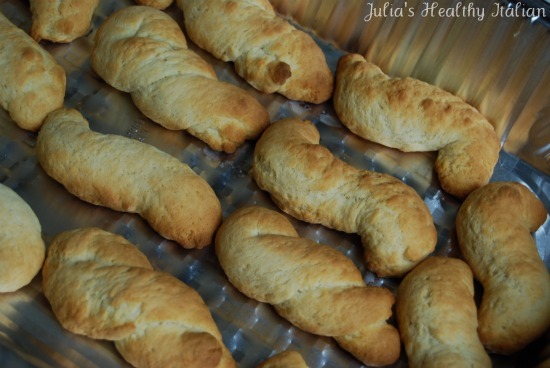 Thanks for the recipe!Cant wait to make these!Growing up we said the "S" was for "Salvatori" our last name.. I love these cookies the recipe I was brought up on is as slightly different but the same ingredients. I have been looking for a recipe like my nanas but I could not find it. my mamas mother called them buscootheez spelled phonetically.